We are at the edge of the OnePlus 2 launch and yesterday the Reservation list for OnePlus 2 invites were open with OnePlus 2 Launch app available in Google Play . As all the rumors came up and OnePlus 2 first looks were spotted in TENAA. Before the actual launch takes place, OnePlus 2 Antutu Benchmark shows up in a video with a score of 49221. Should we call it a leak? Comment below. The first question arising in your mind would be is it's performance better than it's predecessor OnePlus One. The device in the video is 16GB variant and runs H20S OS. 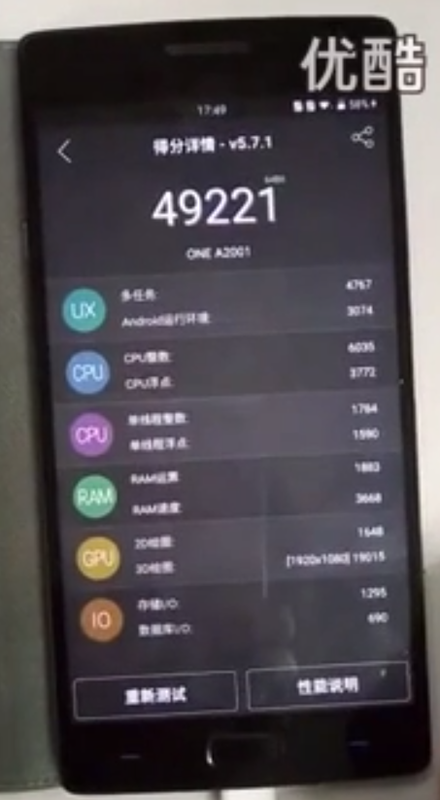 Well Antutu Benchmark score of OnePlus 2 has come upto 49,221. Is the score disappointing? As the rumors orginially started after the phone scores 51,460 on the benchmark test says Phonearena.com . OnePlus 2 in the video shows 1080 x 1920 resolution screen. You can see the video below. As always we would be updating you with the OnePlus 2, so keep visiting and subscribe to our youtube channel - Youtube.com/Asknext.